Kathleen Becker's popular handwoven GARDEN DELIGHT Gift Basket, filled with goodies for the gardener like gloves, seed packets, decorative gardening stake, and a hand-painted shovel! Tucked inside this garden gift basket, you'll find a pair of pink floral cotton Wells Lamont garden gloves , a metal Bumble Bee garden stake in a light purple color, a hand-painted garden shovel featuring flowers, and a 2.5 oz package of Early Golden Bantam Sweet Corn seeds and a 2.5 oz package of Little Marvel Pea seeds. The garden gift basket, which I hand wove from flat rattan reed with a hardwood handle, features plain weaving up the sides. Three fabric yoyo flowers with button centers are attached above the two-color dyed green rattan reed stems, which are layered over the spokes. Single lashed in cane with a flat reed rim for a finished look. A hand-tied raffia bow is attached to the top of the weaving, giving this garden gift basket a very country look! The garden gift basket was lightly stained to mellow the raw weavers, and is initialed and dated on the base by the weaver. This is a wildly popular gift basket for the new home owner, the garden lover, basketry collector or as a unique hostess gift! 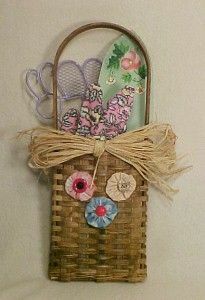 The Garden Delight Gift Basket is intended to hang on a peg, a door or a wall. The basket measures 14" high, 5" long and 1.5" wide.